The template is about the mouth and salivary glands. Digestion begins in the mouth, where chemical and mechanical digestion occurs. Saliva or spit, produced by the salivary glands, is released into the mouth. Saliva begins to break down the food, moistening it and making it easier to swallow. A digestive enzyme in the saliva begins to break down the carbohydrates. One of the most important functions of the mouth is chewing. Chewing allows food to be mashed into a soft mass that is easier to swallow and digest later. Movements by the tongue and the mouth push the food to the back of the throat for it to be swallowed. A flexible flap called the epiglottis closes over the trachea to ensure that food enters the esophagus and not the windpipe to prevent choking. Little digestion of food actually takes place in the mouth. However, through the process of mastication, or chewing, food is prepared in the mouth for transport. Saliva dissolves some of the chewed food and acts as a lubricant, facilitating passage through the subsequent portions of the digestive tract. 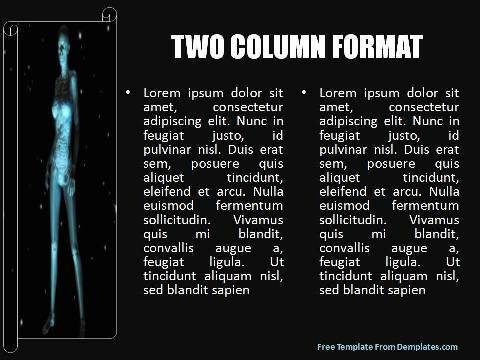 The free Digestive System PowerPoint template is set against a starry night background and features the anatomy of the human body in grey. The template can be used by doctors in seminars to explain the function of the mouth and salivary glands. It can also be used by nutritionists and dietitians in counseling sessions.